It's like an Australia wide second hand party happening all over the country. Garage Sale Trail helps those thinking or planning on hosting a sale to advertise and have it placed on a searchable a map for people to find easily. Users are able to search a town or area of their city and plan out a trail of garage sales to visit. The service is free with resources for not only households but also community groups, local businesses or even the street you live on if you are keen to get one going with your neighbours. According to Garage Sale Trail's website groups use it as a way to fundraise which I think is a great idea. 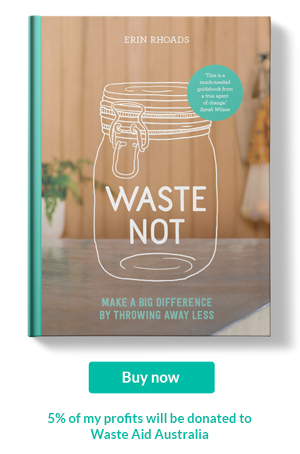 If you are inspired to join up this year its not to late - simply visit their website to learn how to promote your garage sale like a boss this weekend. 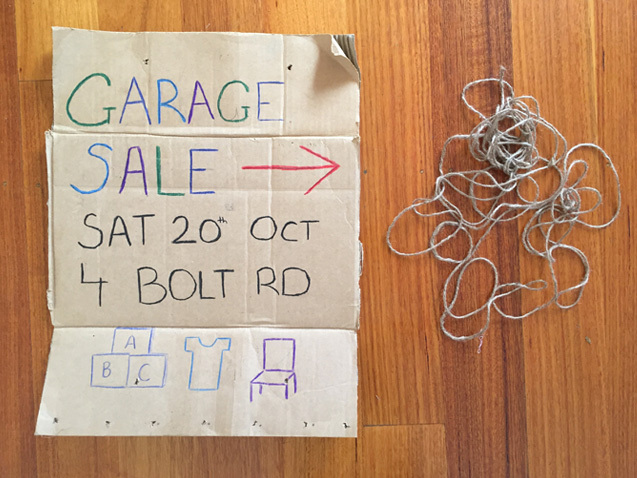 Now, if you are joining the Garage Sale Trail this year (and why wouldn't you?) I'd like to make a request...please don't use balloons to advertise your sale. 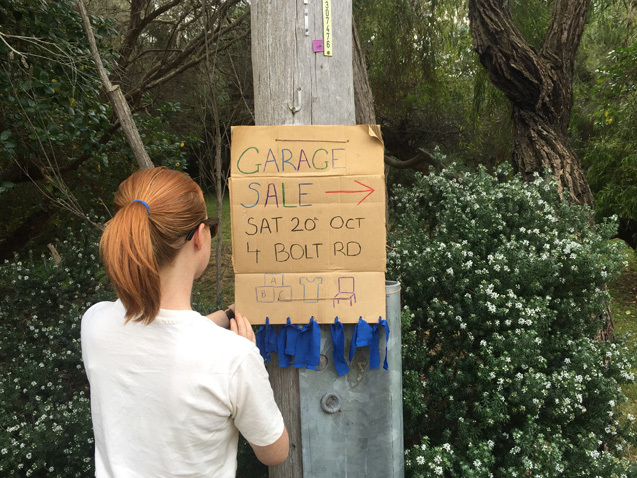 Often after garage sales balloons used on street signs and power poles can be forgotten. Street signs and power polls sit right next to our gutters. Those forgotten balloons will eventually end up in the gutter unless picked up or removed from the poles by people like me and gutters lead to our waterways where those deflated balloons can endanger wildlife. Yes, I know some are made of latex and will break down eventually. But unfortunately our wildlife don't yet know to wait until the balloons have degraded to a small enough size that would make it safe enough to swallow. You can read more at Melbourne Zoo on the dangers and alternatives to balloons. And it's not only the balloons left behind, the plastic tape used to attach signs and those balloons mentioned above to poles also pose a serious threat and are often forgotten too. Most of the littler ending up in our waterways is by accident. 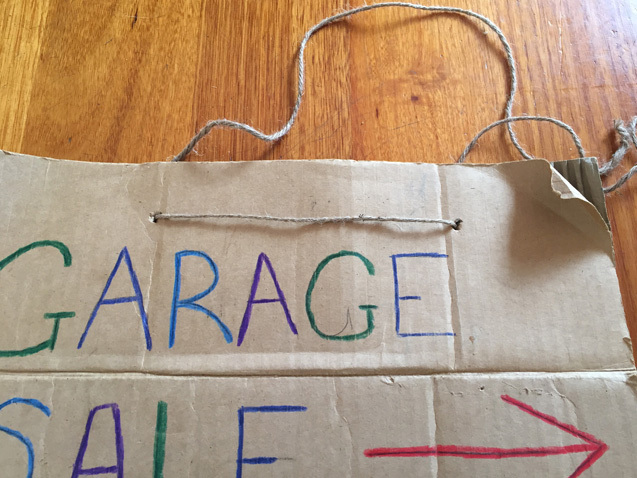 There is another way to hang a sign up alerting the neighbourhood about your upcoming garage sale and you can even add a bit of fun with cotton fabric. Want to see how I created mine? 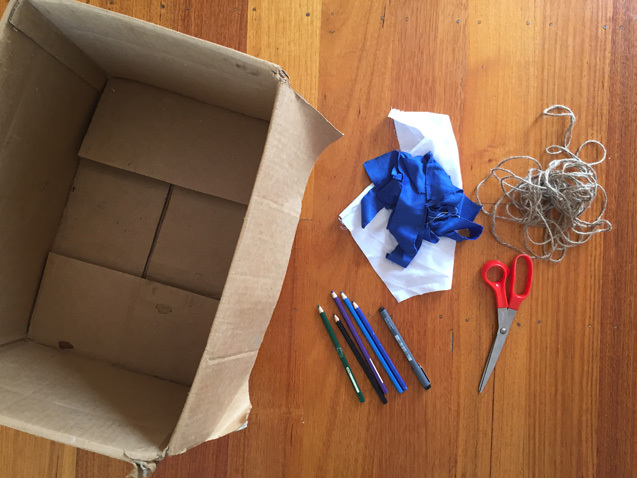 I collect an old box, shone twine, jute or coir string (or hemp...anything made of 100% natural fibres), coloured pencils & pen (didn't end up using the pen), scissors and scraps of cotton or another 100% natural fabric. 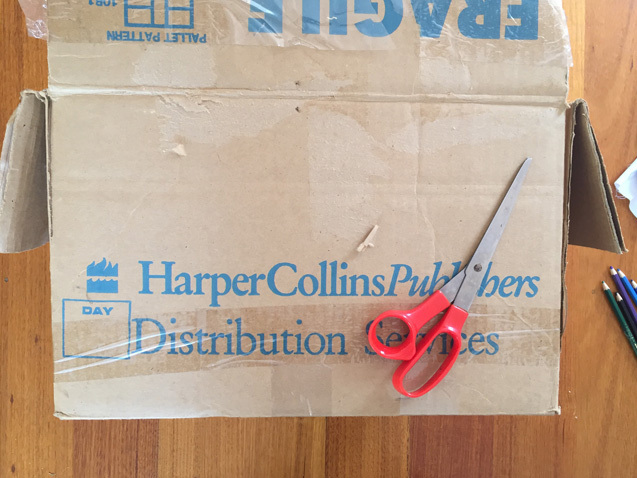 I cut the sides of box and removed the plastic tape too. 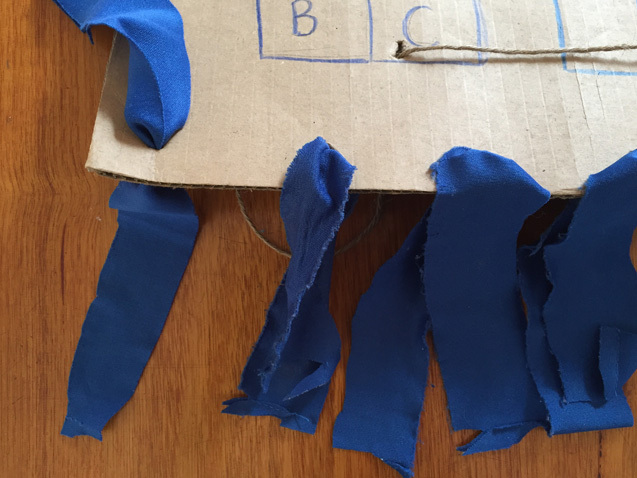 I'll keep the plastic tape rather than leave it on the cardboard to avoid it ending up in the environment. 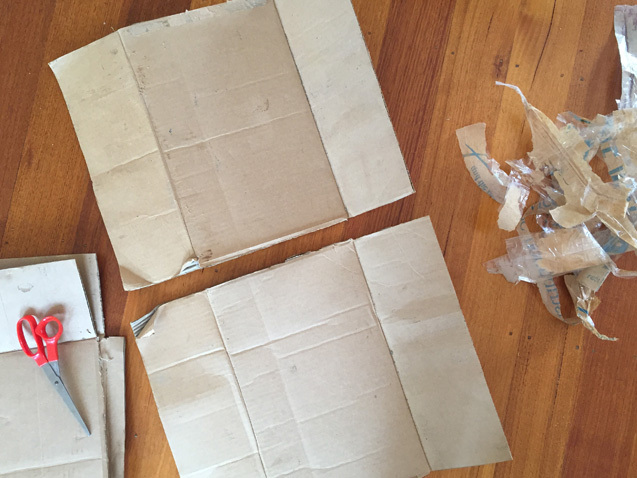 I now have four individual pieces of cardboard. The two larger pieces can be used for the street signs and the others on the day of the garage sale as sign on tables. Using my coloured pencils I write the details of the garage sale. With the scissors I add four holes in the middle top and middle bottom for the string. Seven holes were also added to the very bottom to thread the coloured scrap fabric through. A close up photo of the very professional holes with the string threaded through. And same for the fabric scraps. haha. Now it's ready to hang up on a power pole. If you are looking to put your sign up on pole or anything with a smaller circumference move the holes the string are threaded through closer together. Of course you don't need any fabric or other embellishment if you don't want it. And don't forget to collect your signs after the garage sale. If you know someone who are using balloons and tape ask them to collect after the garage sale and dispose of both properly. 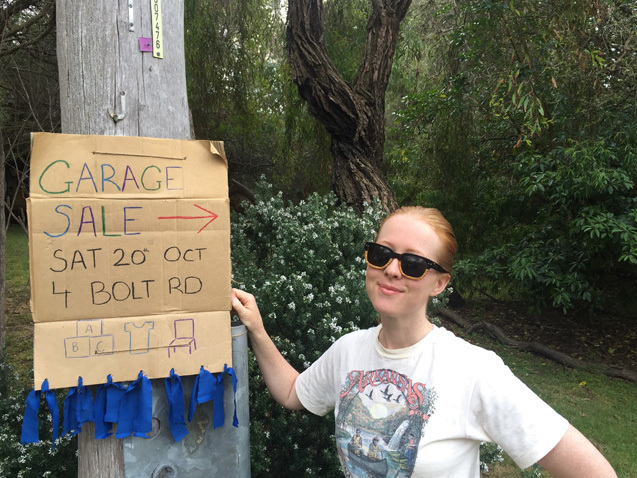 Happy Garage Sale Trail, Australia!